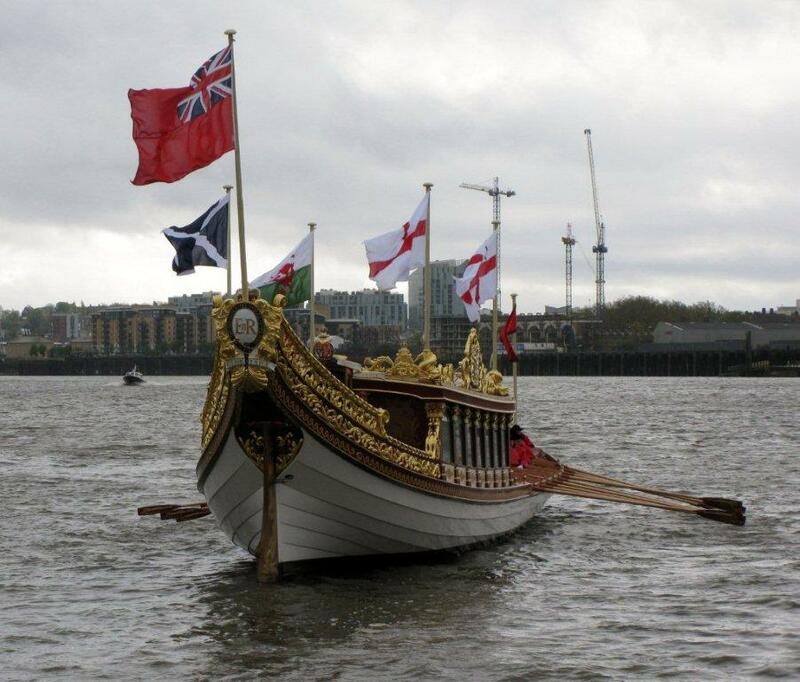 Thames Alive Chairman Peter Warwick looks at the history of state barges on the Thames and describes how The Queen’s Row Barge Gloriana is the lasting legacy of the Diamond Jubilee. 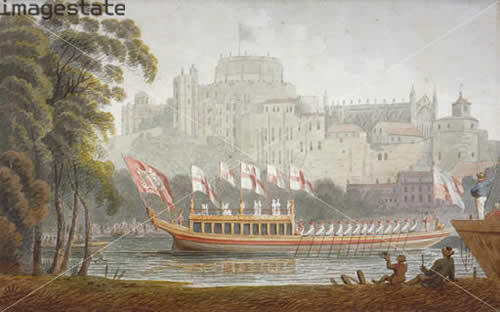 For me it began with the ceremonial re-enactment of Admiral Lord Nelson’s river borne funeral procession in 2005 – the largest event of its kind on the river for well over one hundred years, which in turn led to the formation of Thames Alive and the promotion of a major river pageant to celebrate The Queen’s Diamond Jubilee. In turn this gave the impetus for The Queen’s Row Barge Gloriana. Gloriana is the lasting legacy of the Diamond Jubilee. She is a showcase for British rowing, traditional boatbuilding and craftsmanship, and an inspiration for national pride. She bestows a regal presence on the Thames, enhancing the river's special place in the life of both the capital and the country, and will be used to promote the better use of the Thames. Her presence restores to the river an asset that has been absent for well over a hundred years and echoes the origins and traditions of rowing as a sport. In the words of David Starkey, “As an historian, I’m delighted to see the revival of the great tradition of royal row barges and pageantry on the River Thames. But this beautiful wooden vessel doesn’t only look to the part. It will provide a focal point for the celebration of the Jubilee and also promises to be a lasting asset to the charities and educational organisations using the river in their work”. As such, Gloriana places a particular emphasis on inspiring and encouraging young people of all backgrounds and abilities to discover rowing’s remarkable characteristics of teamwork and fellowship. She will also be used to support The Prince’s Trust, royal supported and other charities, and will also be present at major river and rowing event, such as Henley Royal Regatta, so that the public has frequent opportunities to see her close to. 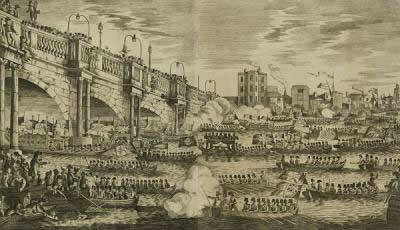 Before horse drawn coaches were introduced into England, most royal or state processions in London went by water. 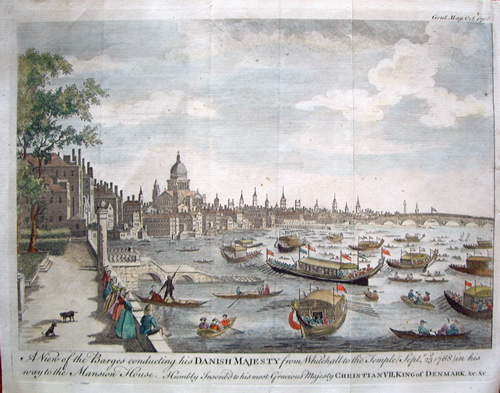 As the love of pageantry grew in the time of Henry VIII, so processions by water from the City of London up to Westminster or downstream to Greenwich, became part of the pattern of city life. Not only was it the more direct route, but it was also pleasanter at a time when open sewers ran through the plague-infested streets and spectators at processions were crushed against walls. Moreover, the royal residences were on the Thames, and the town houses of many of the nobility had gardens stretching down to the waterside, with their own landing stairs. The Thames was the equivalent of today’s M4 motorway and the state barges were the limousines! By the 16th century the precedence of the Companies was carefully regulated. First went The Lord Mayor’s Barge, followed by the barge of his own company, to which also fell the task of staging the masque or pageant. Then followed the other companies in the traditional order: Mercers, Grocers, Drapers, Fishmongers, Goldsmiths, Skinners, Merchant Taylors, Haberdashers, Salters, Ironmongers, Vintners and Clothworkers. When royal barges were also i the procession a halt was called on the return journey and the companies’ barges lined up on either side of the river to allow the royal barges to make their way forward to the front, receiving salutes as they did so. Arguments over precedence constantly broke out! With increasing prosperity in the 17th century and more frequent public ceremonies, most of the companies acquired their own barges, and permanent decorations were painted round the whales of the vessels, and included the companies’ emblems and insignias. During the 18th century hulls became lower with flatter and straighter sheer lines and into the 18th century the canvas awnings of the house gave way to wooden roofs accessible with railings and stairways. Atop the house were colourful flags and banners and aft were seats for the musicians, who were an integral part of such festivities. From the earliest days the provision of ‘a mynstrelsie’ was the first requirement for good entertainment, and the procession would pass ‘with all its drumes and flutes and trumpettes blohying’. 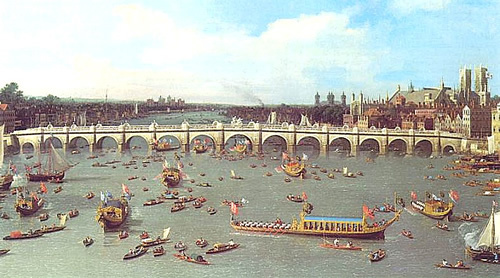 The Commonwealth put a blight on such pageantry, but ‘the most magnificent triumph that ever floated on the Thames’, according to John Evelyn, restored the tradition when Charles II on the occasion of his wedding to Catherine of Braganza in 1661, ‘came in an antique-shaped open vessel, covered with a state, or canopy, of cloth of gold, made in form of a cupola, supported with high Corinthian pillars, wreathed with flowers, festoons and garlands.’ Nevertheless, in spite of great pageants in 1714for George I’s coronation, 1733 for the reception of the Prince of Orange and 1768 for the arrival of the King of Denmark river pageants were less fashionable. 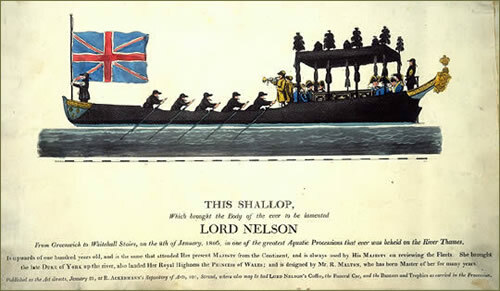 Then a splendid ceremony of a different kind took place in January 1806 when the body of Admiral Lord Nelson was brought in procession up river from Greenwich to St Paul’s Cathedral for the burial service. 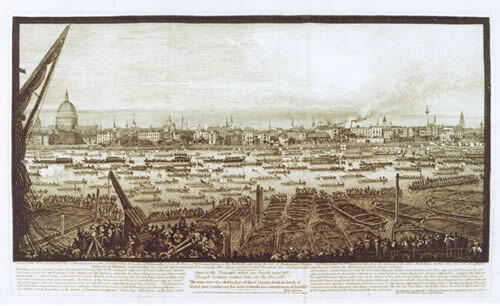 It was a scene of magnificence as the barges of the Admiralty, the Lord Mayor, the Livery Companies and others swept away from Greenwich, with naval craft firing minute-guns alongside the funeral barge, sombre under its black pall. 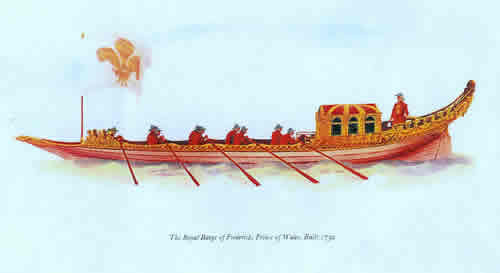 The barge had been built for Charles II. The lines are simple but there is no superstructure, and it hardly ranks as a state barge. Maybe that is as it should have been be for Nelson, for it is clearly more like a ship’s boat, with which he was so familiar and in which as a teenager in the Thames itself he went ‘in the cutter and decked long-boa, which was attached to the Commanding officer’s ship at Chatham. Thus by degrees I became a good pilot, for vessels of that description, from Chatham to the Tower of London, down the Swin and the North Forland; confident of myself amongst rocks and sands, which has many times since been a great comfort to me’. 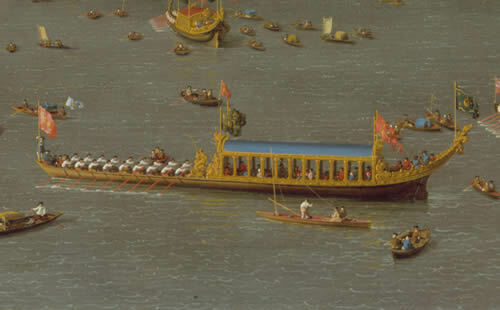 Unlike Charles II’s barge, the state and livery barges had a high or ‘lute’ stern, which helped the bargemaster to obtain a good view of the river. The bargemaster was an important personage not only in the companies but also in royal and noble households. As early as 1486 the Royal Bargemaster was protected by royal charter. His costume has varied little and it appears that the watermen were the first public servants to wear uniforms. Since the 18th century the royal bargemaster has worn a scarlet coat embellished with the royal insignia in silver braid on the front and back, kneebreeches, buckled shoes, white silk stockings, and a cocked hat. The Royal Watermen also wear scarlet, laced with gold with a gilt badge on the arm and a peaked jockey’s cap of black velvet. These uniforms are still worn today but not since 1849 did The Royal Bargemaster and the Royal Watermen under him have a Royal Barge to fulfil their duties. The Queen’s Row Barge Gloriana has changed that. Moreover, the succession of river pageants since 2005, starting with The Emirates Thames Nelson Flotilla, and including The Tudor Pageant in 2009, Henry’s Honeymoon in 2010, The Lord Mayor’s Show in 2011, and of course the stunning Thames Diamond Jubilee Pageant and the last day of the London 2012 Olympic Torch Relay this year, have opened a new chapter in the ceremonial use of the Thames. 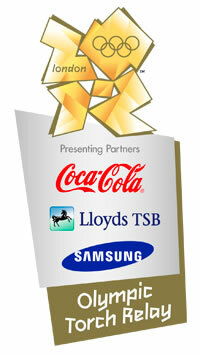 Once again it is witness to the proud and stately occasions that delighted the hearts of our forbears.